Following a superb 2018 campaign that saw him capture the ONE Strawweight World Championship, Filipino star Joshua “The Passion” Pacio is looking to keep the fire burning in 2019 as he’s set to defend his title for the first time against Japanese challenger Yosuke Saruta in the main event of ONE: ETERNAL GLORY on 19 January in Jakarta, Indonesia. Saruta however, wasn’t the initial choice tapped to challenge Pacio. Originally scheduled to face the champion was a man who had already defeated him before in Japanese submission machine Hayato Suzuki, but an injury forced Suzuki out of the bout, clearing the way for Saruta to step in. In Saruta, Pacio also faces a tough, Japanese grappler who made an instant impact in his ONE debut by defeating former titleholder Alex “Little Rock” Silva last December. The opponent change, however, isn’t worrying Pacio too much, given that there’s still enough time to adjust and prepare for the new challenger. "As a martial artist, you need to adapt. It has already happened to me in the past, and I was able to adapt through it,” Pacio shared on ABS-CBN. “The game plan will be changed, but that’s okay. It’s better now because there are still weeks to prepare." With just a little over two weeks to go before the big night, Pacio says that the next coming days in training are crucial. The looming title defense has forced the 22-year old Team Lakay standout to make some sacrifices, especially with the recently concluded holiday season. While the Christmas and New Year period usually means a time of rest and relaxation for most people, especially in the Philippines, Pacio was putting in the work, even on Christmas Day. "It’s the sacrifice that I have to do because it’s my first title defense," he said. "On Christmas Eve, I spent it with my family, but the day after, I was back in training." All part of the game for Pacio, who will be the first Filipino ONE world champion to put his title up for grabs in 2019. 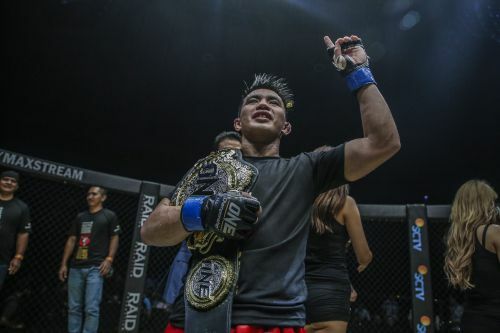 A win for Pacio will definitely give his fellow titleholders a massive boost as they head into their respective title defenses in 2019.